Surrounded by the majestic Aravalli Mountains, the ancient city of Ajmer is situated in the heart of Rajasthan. The city was founded in the seventh century by King Ajai Pal Chauhan. He built a hill fort and named it Ajaymeru or ‘The invincible Hill’. The city served as the seat of the Chauhan dynasty for many years. After legendary ruler Prithiviraj Chauhan’s loss to Muhammed Ghauri, the city saw many upheavals. In 1559, it was conquered by the Mughal Emperor Akbar. In the 18th century, the Mughals sold it to the Marathas who in turn sold it to the East India Company for a mere 50,000 rupees! Then followed a period of peace and stable governance. In 1947, Ajmer finally merged with the Indian State. 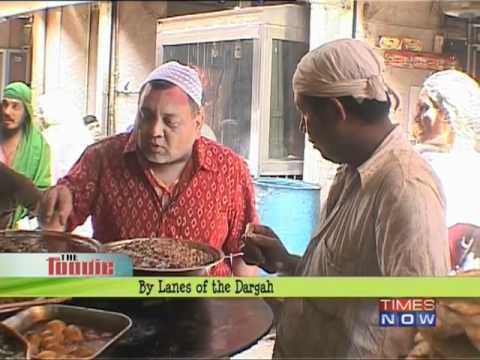 Dargah Sharif – This is the tomb of the most revered Sufi saint Muinuddin Chishti. It said that one who prays with a pure heart has his desire fulfilled! Located at the foot of the Tārāgaṛh hill, the shrine consists of white marble buildings overlooking two courtyards. There is a massive gate donated by the Nizam of Hyderabad, a mosque donated by the Mughal Emperor Shah Jahan, the Akbari Mosque, and the domed tomb of the saint. Every year, a festival or ‘Urs’ are held here in honour of the patron saint. During these days, special prayers are offered, huge amounts of consecrated food are given to devotees and religious songs are sung all night. The Urs unite people of all faiths and the city wears a festive look! 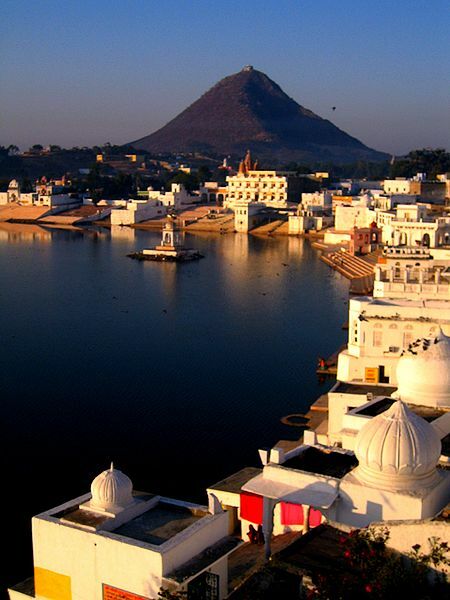 Pushkar – Located 11 kms away from Ajmer is the holy city of Pushkar. It has a temple dedicated to Hindu God Brahma, the only one of its kind in the world! Come November, the town comes alive. That’s because it is time for the Pushkar Fair. If you want to experience the true beauty of the town, this is the time to visit! The city is brightly decorated, people wear colourful attire and there is a burst of activity all around. A dip in Pushkar Lake is said to grant salvation to the soul so many Hindus converge upon Pushkar during this auspicious time. Taragarh Fort - This towering fort virtually stands guard over the city. It has six imposing gates. It houses the tomb of Miran Saheb, the brave governor of the fort who laid down his life in the line of duty. 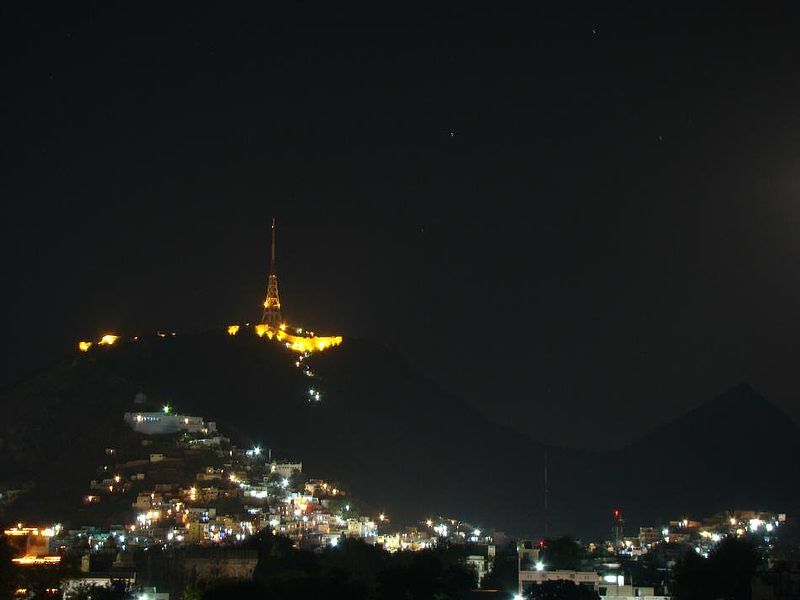 You can a get panoramic view of the city as well as the Aravalli ranges from this fort. Aḍhai Din ka Jhonpṛa – Legend has it that this monument was constructed in two and a half days or ‘adhai din’, hence its name. It is considered a masterpiece of Indo-Islamic architecture. It is located on the lower slope of Taragarh hill, and is famous for its double-depth calligraphy inscriptions in ancient scripts. Another remarkable thing about this monument is that it has forty columns supporting the roof but no two are alike!